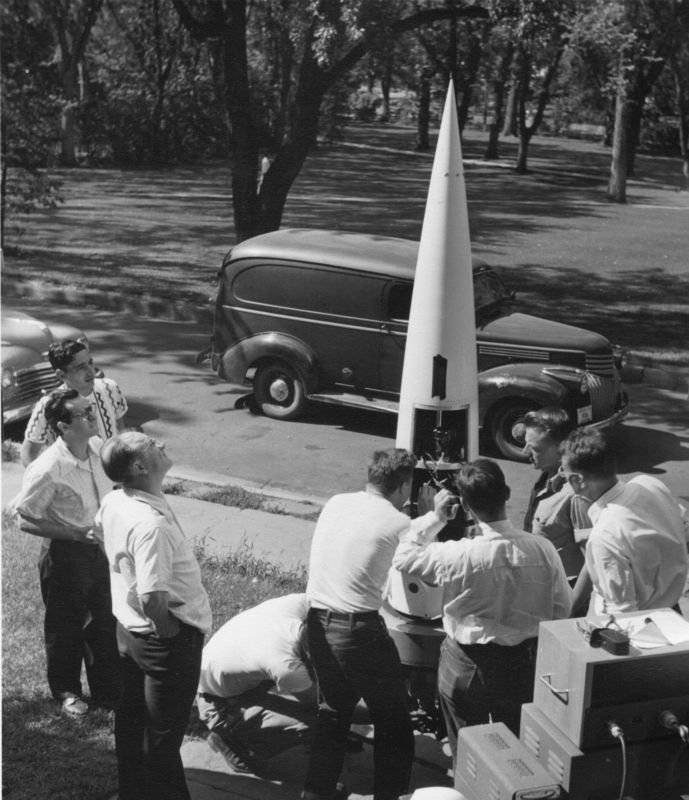 Rocketry has been fundamental to LASP since 1948, when our lab began as the Upper Air Laboratory (UAL). UAL was created by CU-Boulder physicists a decade before NASA to study Earth’s atmosphere and develop a stabilized platform for instruments launched aboard sub-orbital rockets. After World War II, UAL started flying instruments on rockets that were being tested by the U.S. Air Force. The first UAL-built scientific instruments were launched using captured German V-2 rockets, the predecessors of the American Redstone ballistic missile. In 1956, UAL solar rocket engineers partnered with the Ball Brothers Company and spun off to form the Ball Brothers Research Corporation, which is now the Boulder-based Ball Aerospace & Technologies Corp. LASP continues to partner with Ball on numerous space missions today. By the dawn of the Space Age, UAL had already been flying sub-orbital rockets for almost a decade. When the U.S. government formed NASA in 1958, UAL began flying instruments on NASA’s solar-observing rockets. UAL became LASP in 1965 and began expanding its capabilities into solar-observing spacecraft, Earth atmospheric satellites, and space and planetary sciences. However, LASP maintains its foundational expertise in rocketry, and our Rocket Program remains dynamic today with a focus on sounding rockets.